Thraciae veteris Typusb Orbis terrarum - CLUVER,P. Title : Thraciae veteris Typusb Orbis terrarum. Size : 6.3 x 8.1 inches. / 16.0 x 20.5 cm. 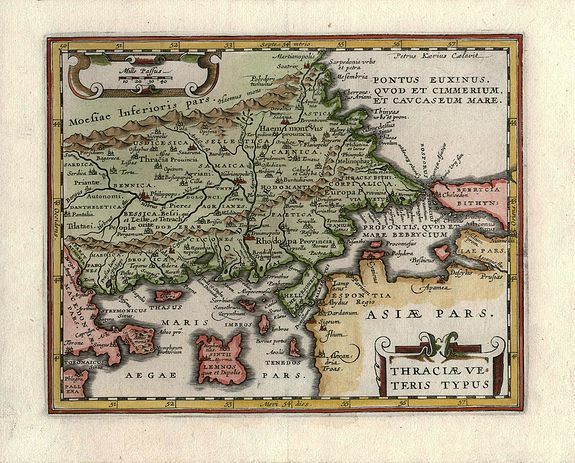 Description :This small map covers the ancient region of present-day European Turkey and part of Greece. Strapwork title and scale of miles cartouches. Engraved by Petrus Kaerius and based on Ortelius's map of the same title.